Starting May 2016 Jacquard has renamed and relabeled the well known "Discharge Paste". Still the same reliable product just with a more descriptive name. They have also added a 4 ounce mist sprayer to the line up for additional deColouring fun. 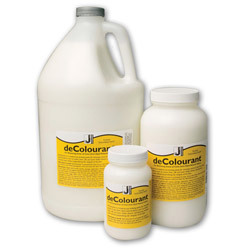 deColourant is a reducing agent for safely removing color from natural fibers, and is even safe on silk. It removes most fiber reactive dyes (such as Dharma's Fiber Reactive MX dyes), direct dyes, and many acid dyes, especially the "leveling" ones. The pre-metallized ones and some milling don't discharge. It is thick enough to block print, brush it on, screen it on, stencil it on, etc. You can apply the paste to your fabric, let it dry and steam it with a steam iron or steam in a steamer for 10 minutes or so, until it stops discharging. Then wash your fabric in a good detergent like Synthrapol, and rinse in Milsoft to restore softness. Wear gloves and work in a well ventilated area when using discharge chemicals. deColourant does not always remove all of the color, it depends on the dye and the color to which it is applied. For example, some yellow Fiber Reactive Dyes don't discharge, but the blues do, so when you discharge a green, you may get a yellow, orangy or peachy color. Always best to test! We have also found it works best when fairly fresh. It can be used for creating interesting negative image effects. Use in silk painting and tie-dye: paint on retied, dyed garments after they have dried for great effects. See our Discharging Directions for more info. It is fairly safe to use but does have a strong ammonia smell so use it in a well ventilated place. Note - Due to a changes in the black dyes used on our pre-dyed BLACK clothing items, deColourant sporadically works on these items. Other commercially dyed fabrics and garments are a total crap shoot, because you have no idea what they are dyed with. Test, test, test!!! Sometimes if this won't discharge something, bleach or our new Jacquard Screen Ink Discharge will, so the best discharge artists do a lot of experimenting! Bethany Schlegel activating her beautiful deColourant prints of ferns on linen. I will echo the perennial reminder: TEST! This was the first time I had tried discharging and the results were not what I expected but they were definitely interesting. I found that steaming with an iron did almost NOTHING. Had to use a pot on the stove with one of those folding metal steamer baskets. WOW! I discharged raw silk dyed with acid dye (color was spruce). Areas painted with the discharge paste turned shades of blue and orange. Very cool but very unexpected! I LOVE this stuff. I use it to stencil with freezer paper and I thin it down and apply it through a squeeze bottle like gutta. It stinks when I iron it but it does such beautiful stuff that I ignore the smell. This product goes along ways. I bought it to teach a class of 18 people how to use the product using stamps and stencils. We used about a third of a quart.I had about a 18 cup from a jar I had purchased several years previous. That product did not remove as much color sodon't buy more than you can use in a year or two.I did notice the fumes when we began to steam iron our t-shirts. I'm glad we had set up outside to do this.Everyone was pleased with what they did. Wow! This stuff is great! I never had this kind of control with bleach! I've just used this once and next time I'll thin it down a bit so I can really get into the fibers. It did remove color enough that I could tranfer a design on to it so it was successful. I need to practice some more. Great but stinks! It does exactly what it is supposed to but is so stinky I really don't like using.Make sure to use in a ventilated area as I didn't and it started to make my throat sore. This would work well with stencils or screen printing but works horribly with block printing. I wish descriptions for this product did not say it can be block printed. I tried with a linocut block onto bandanas and it did not work. It's way too thin and won't stick to the block. It also oozes into the nooks and crannies of the block. I wish there were a way to add tack so it would work better because it's a cool product to use on fabric. I may experiment to find a way to make it work. I have used the paste color remover for years. I paint it squirt it out of bottles silkscreen stamp and stencil with it. Works great on procion dyed fabrics. This is a good productbut does not remove color on all fabrics. Before you use discharge pastecheck to make certain there is no sizing on you fabric. Works really well with Procion MX dye. Great results. Superior instructions from from Dharma trading. Well packed fast delivery and great customer service. Thanks Dharma Trading. I will be back for more products. This did exactly what it said it would. I will be purchasing this again. Thank you Dharma. This was fun! We used it on a few black items. The designs on some turned yellowish but on mine they turned blue. That was a great surprise since we were stenciling the moon in different phases.